Hey everyone! Valentines is almost near, and what a better way to start the week with some heart design, and of-course some chevrons. I for one do not think Valentines is for just couples, but a way to show love an affection for everyone else (friends, family etc). However, for me it's actually one my least favorite holidays lol...I see no point to it, but that's just me. Either way, I find any excuse to create some heart designs! ;) I few weeks ago, I gifted myself by purchasing some KB Shimmer polishes, which believe it or not, one of my top favorite indie brands. 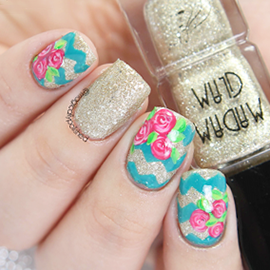 I even was excited to use some chevron nail vinyls from Whats Up Nails (which btw is my new favorite store). Many people think as a glitter based polish, there's no way to create some nail art designs...well I think there is. So for this look, I applied three easy coats of KB Shimmer Falling For Hue, a gorgeous crelly glitter polish with tons of red, fuchsia and pink metallic glitters in various of sizes. Whats Up Nails. Once the vinyls was set, I then applied Essie Good as Gold and Kiko Nail Lacquer 238 Martha Red on all of the nails.